Raised for the first three years of her life by her grandmother, who'd immigrated from Mexico and lived in a neighborhood near the border in San Diego, Claudia Lucero said that her grandmother was a huge influence on her life and that they shared a special bond, one bound up in culture and a common passion for good food. Lucero remembers regular visits to Mexico so that her grandmother could see relatives there, and that during those visits they'd go to the tortillerias and fresh cheese shops and make cheese tacos right on the spot. Another treat was the instant chocolate mix called Maizena that her grandmother used to make a drinking chocolate called atole. 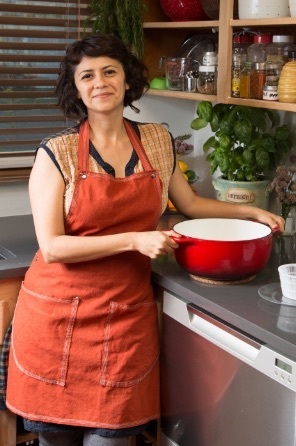 Cheese maker and author Claudia Lucero. There were also the doughnuts her grandmother would make using inexpensive rolls of biscuit dough from the store that she'd roll out into disks. She'd have Lucero rummage in the kitchen for a just-the-right-size cap from a bottle to use for cutting the hole, then she'd fry the disks in oil until they puffed up before young Claudia's eyes. Large blocks of surplus government cheese were a staple that was always available and "kept us going," Lucero recalled. After the age of three, she and her sister lived with their mother, who considered herself "a modern woman and working single mother" who had no interest in cooking. Lucero took over the job and recalled cutting the orange government cheese into cubes and cooking them in the microwave until they melted, turning them into crunchy cracker-like crisps just like the frico that's so popular now on restaurant menus and at deli counters. 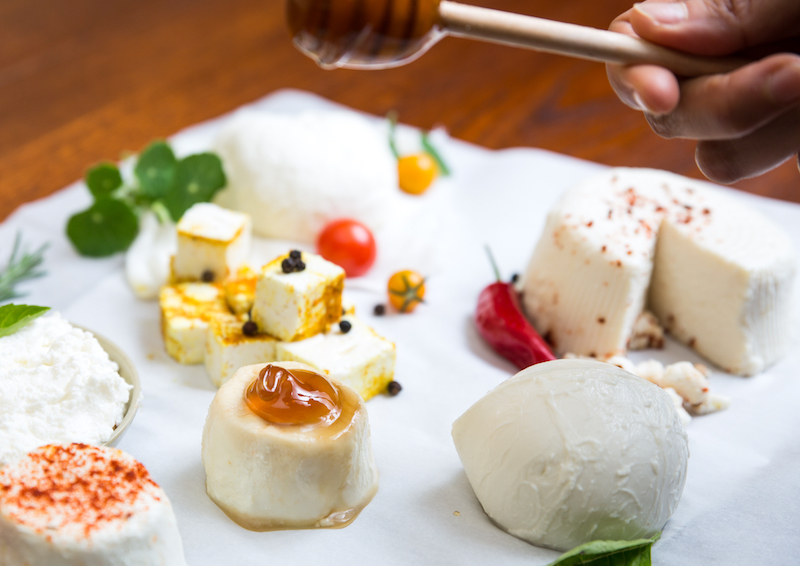 Fresh cheeses you can make at home. For several years Lucero worked for nonprofit organizations in San Diego focused on providing support services to girls, women and the LGBTQ community, then came to Portland to work for the Rock and Roll Camp for Girls. 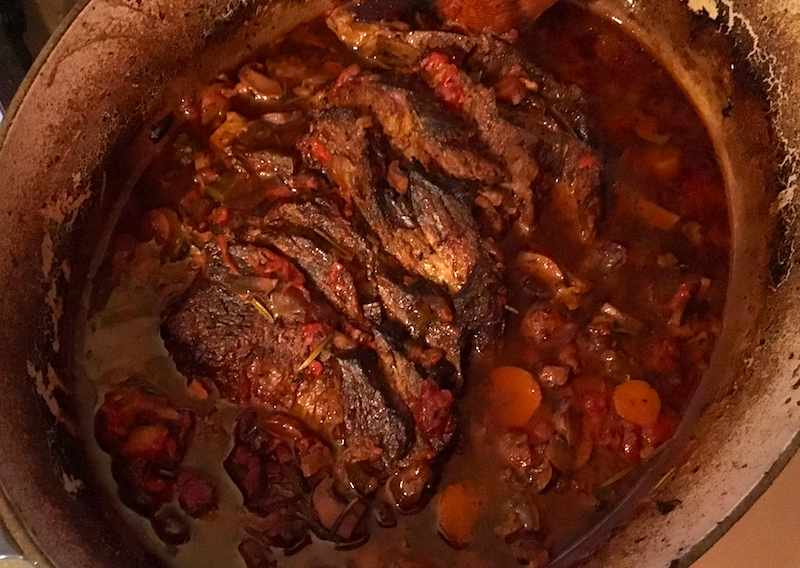 For several years she'd been dabbling in home cooking projects like pickling and making bread, yogurt and simple fresh cheeses such as paneer, but it was feedback from friends at a weekly soup night that caused Lucero to take these pursuits more seriously. The breads and cheeses she made and contributed to the communal meals got consistent raves, so when a friend's mother was visiting, Lucero put together a simple cheese making kit—containing citric acid, salt and cheesecloth—as a gift. With her nonprofit job barely covering her living expenses and with student loans to pay off, she had the timely epiphany that these home cheese making kits might be something people would buy for themselves or for a gift. 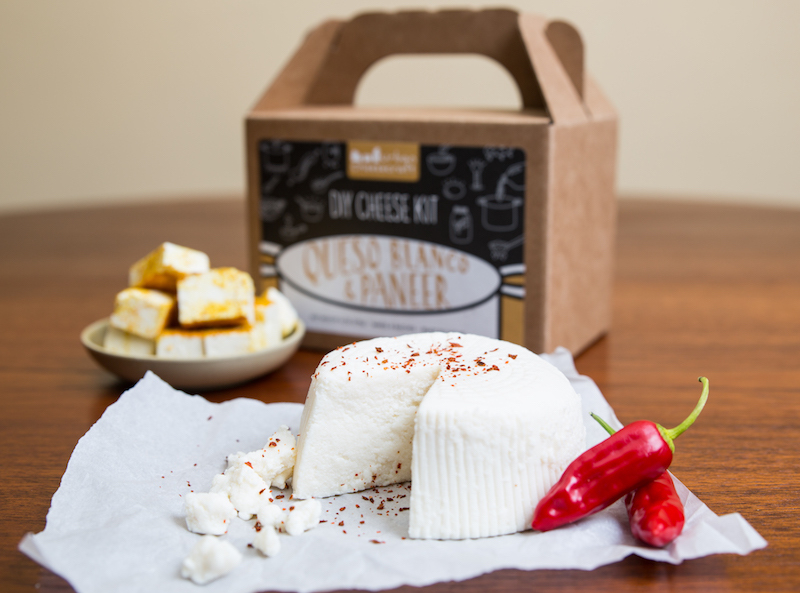 Queso blanco and paneer traditional cheese kit. At the time, that meant getting her home kitchen approved for food production from Oregon's agriculture department, a process that has been made easier by Oregon's Home Kitchen Licensing law passed in 2016. Coincidentally, the website Etsy had launched a couple of years before Lucero formed her company, Urban Cheesecraft, in 2009, and it provided the creator-friendly platform she needed to get her business up and running. A success almost from the start, Lucero was producing her kits solo, doing all the purchasing, promoting, packaging, sales and distribution out of her home. That's when she got a call from Whole Foods asking if she could supply their Pacific Northwest stores with her kits, to the tune of 20 kits per store, which added up to 500 kits per month. Shortly thereafter, New Seasons Market started requesting her kits for their stores. The good news? She paid off her student loans within a year. The bad news? 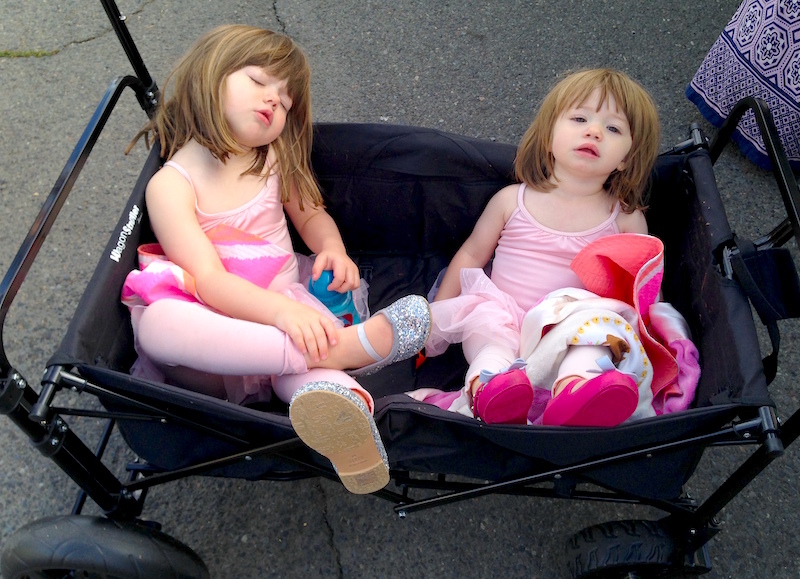 After two years, she was exhausted and realized she could no longer do everything herself. Lucero's first book on home cheese making. 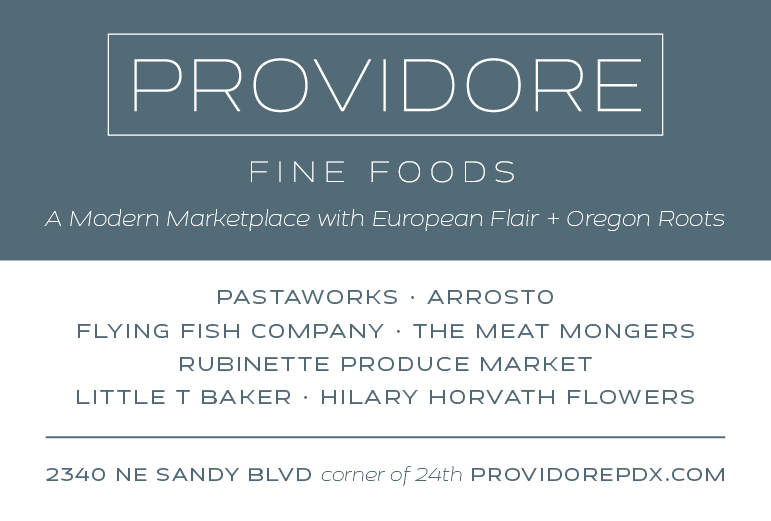 Fortunately, at about that time Portland distributor Provvista Specialty Foods (sold in 2011 to Chef's Warehouse) stepped in to pick up the sales and distribution aspects, which took a huge load off of Lucero's shoulders. Then she was laid off from her job, giving her more time to focus on the business. Fortuitously, within a month of being laid off, kitchenware and home furnishings retailer Williams Sonoma came to her with an opportunity to develop custom kits for the chain's stores, and Workman Publishing offered her a book deal. 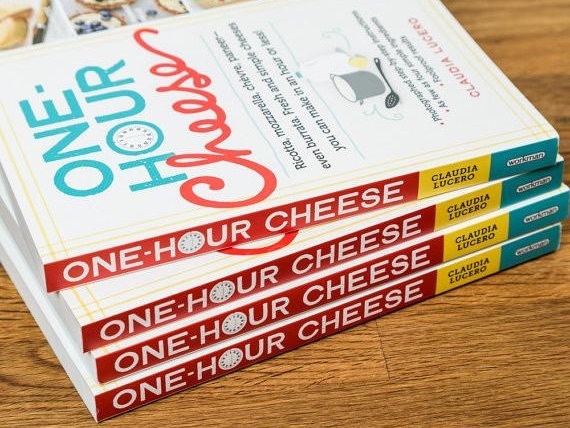 Her book, One-Hour Cheese: Ricotta, Mozzarella, Chèvre, Paneer—Even Burrata, was an almost instant hit with its simple instructions and step-by-step photos that guided even the most cooking-averse readers through properly heating milk, stirring curds, molding, kneading, and stretching the cheeses. One reader commented, "[Lucero] starts you out at the very beginning with a fast and easy farmer's cheese. This is so basic and easy that it encourages you to know you can do this and will keep people reading the rest. She also has many photos, so you can really see if you are on track. Very well thought out." As the business grew, Lucero found a co-packer, DePaul Industries, which could put together the kits for her. She then switched to another outsourcing company, Relay Resources, to assemble the kits so she could concentrate on recipe development and work on her second book about making dairy-free cheeses at home. 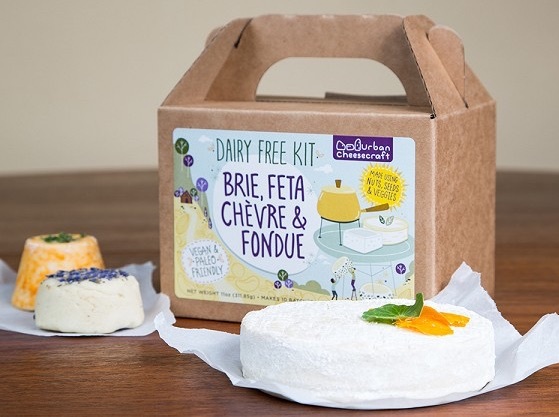 Called One-Hour Dairy-Free Cheese, it came about because of the questions she got "from day one" about using non-dairy ingredients with her traditional kits. (You can't.) She also hired a sales director to manage the business flow, and found a new distributor, Frontier Co-op, to handle the new dairy-free kits. Lucero said that, as a person who loves cheese, it was interesting to start making the dairy-free versions. Judging from the types of vegan cheeses available in stores, she came to believe that most vegan cheese makers—understandably—don't know what real cheeses taste like any more. So her aim? 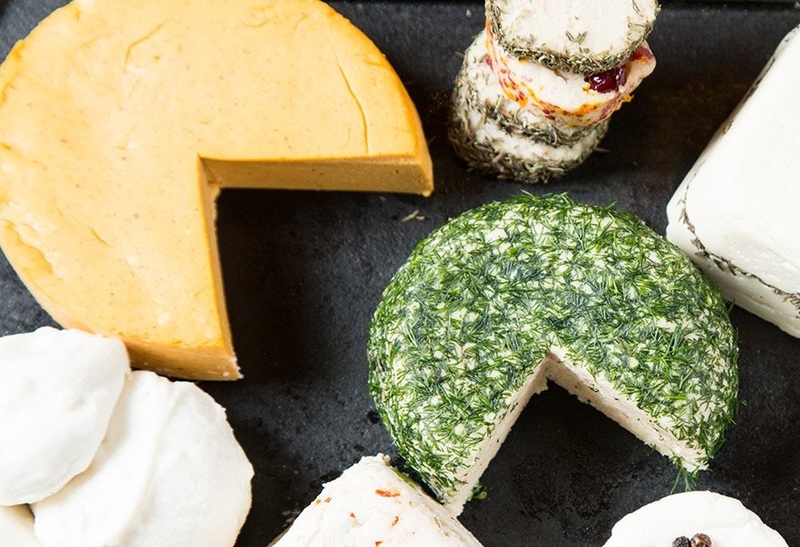 To develop vegan cheeses that taste like real brie, fondue and feta, just a few of the many styles she's developing. "Cheese is milk's leap toward immortality," she says in her video on Etsy, quoting author and media personality Clifton Fadiman. She adds, "Whether it takes an hour or a month [as with aged cheeses], I want to make it easy, accessible and empowering for people." Perhaps the most surprising thing about the event I moderated the other night, A Taste of Europe, came toward the end of the evening when the featured speaker, Dr. Lorenzo Terzi, European Union Minister Counselor for Health and Food Safety, said that if he had his way there would be no barriers to trade between the European Union (EU) and the United States. Zero. None. That's a pretty big bombshell coming from a guy who's spent his career negotiating trade deals, and he admitted it was a risky thing to say, but Terzi posited that if the EU and the US were to agree to drop trade barriers in both directions at the same time, everyone would benefit. (Obviously regulations on safety, health, etc., would still be in force.) I'll leave it to those more knowledgeable about world trade to hammer out the details, but I'm inclined to give him the benefit of the doubt on this one. With Center for Animal Law Studies Dir. Kathy Hessler. At the evening panel discussion, the 100-or-so guests packed into the room sampled Belgian waffles from Offty Waffles, which were piled sky-high with whipped cream; pretzels from Urban German Grill; and cheeses and dips from Elephants Delicatessen, as well as beverages from Europe and the U.S., while Terzi presented his case for opening up trade with the EU. 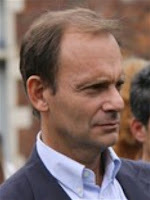 His main focus was the imbalance between the U.S. treatment of the EU as 28 separate entities, forcing the member states to individually work out separate export request files, a duplicative, expensive and time-consuming effort, rather than treating the EU—as the member states have since the Maastricht Treaty of 1993—as a "Single Entity" trading partner. 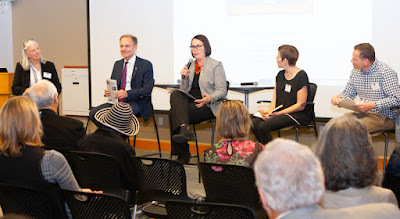 The evening also featured Alexis Taylor, Director of the Oregon Department of Agriculture, who outlined the extensive nature of Oregon's longstanding trading relationship with Europe. 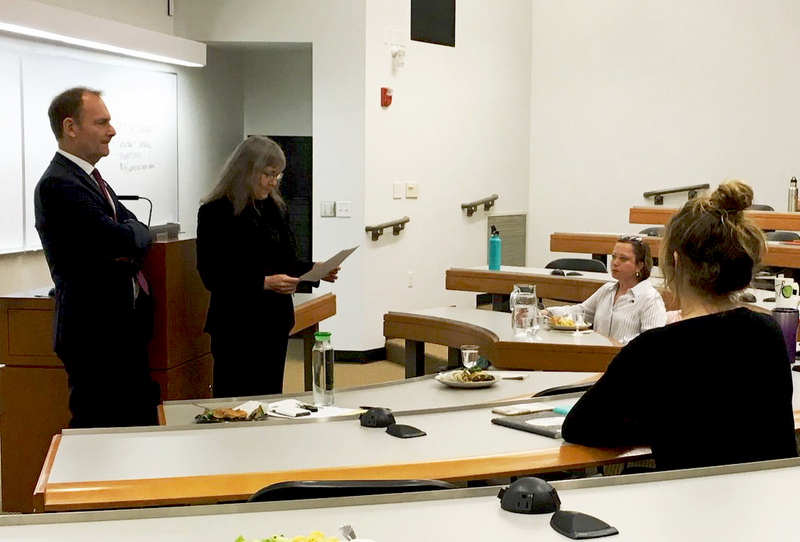 Katy Millard, owner and chef of Coquine and a 2018 James Beard Award finalist, discussed her view of the contrasts between her work in the kitchens of France and U.S., as well as the food safety environment in both countries, which she considers comparable if subtly different. Rounding out the panel was New Seasons Market's Oren Kariri, who gave an overview of the company's food safety program as well as covering the importance of foods imported from the EU in its mix of products. Questions from the diverse audience ran the gamut from questions about Italian olive oils imported from Italy, Terzi's home country; to the ways that the EU and the US view the relationship between agriculture and climate change; to the potential value of seeking a career in food safety. As for his response to his whirlwind trip to Portland that involved the lecture, several farm tours and the evening panel? It was summed up in a tweet he sent out when he got home: "It was a real privilege to talk the 'EU lighthouse' effect on food safety and animal welfare [to the Lewis & Clark students]. Let’s continue to change the world together!" Read my interview with Dr. Terzi and find out why he says, "Farmers are my heroes." 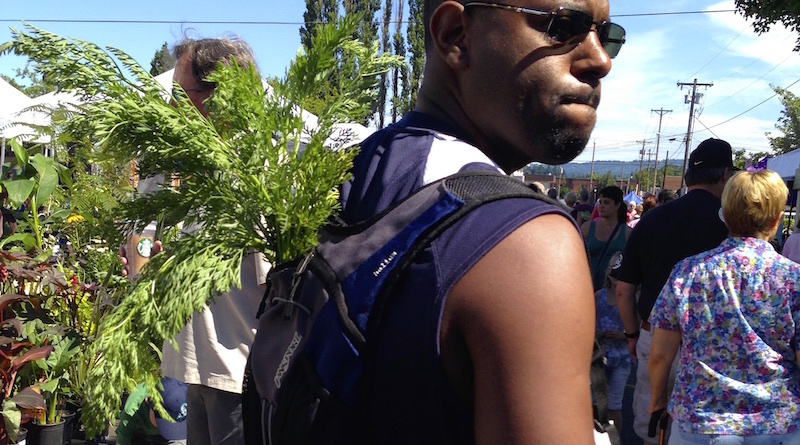 We farmers' market people tend to care a lot about the earth, and our impact on it. As such, we work hard to have a net positive impact in our actions and approach to food and always seek to pass that along to our customers. That being said, there are times when the drive for quality and convenience means that we use plastics or other disposable products. Because we want to balance our desire to be more green with the realities of running a public market, we thought we'd share six super simple ways you (the customer) can help green up the market every time you shop. Reusable bags are the best! This one is probably the lowest hanging fruit—most of us have a least one reusable bag hanging around at home. Keep it somewhere that you'll remember to bring it with you. If you forget, or just want to sport a new look, most markets have heavy-duty bags available at the information booth. They can hold a pretty hefty market haul and are machine washable. If you are doing an especially heavy shop, consider bringing a wagon (some markets provide wagons) to pack it in and out! Along these same lines, you will likely be offered smaller plastic bags for produce at market stalls—you can always decline to take one. Just use your market tote as a carryall for the day's purchases. If you like to keep your items separated (or simply need to corral smaller items, like tomatoes) consider purchasing cotton or mesh produce bags. Look for the recycling station. One of the biggest challenges we face at the market is making sure that our recycling is "clean." We often find that things have been tossed into the recycling bins that we end up having to trash. The biggest culprits? Coffee cups, bottle caps, plastic straws and containers with food refuse on it. When these get mixed in with the recycling, our volunteers have to hand-sort and remove them (which is no fun at the end of a long day). If you aren't sure whether or not something is recyclable, ask before tossing it in. Eating a plant-based diet is one of the best things we can do for the environment. This doesn't have to mean eschewing meat and other animal products entirely—it can simply mean shifting your focus to prioritizing foods like vegetables, legumes and fruits. Stock up on fresh, seasonal items that fit this bill and use recipes that make these items the star. A wagon can come in handy! A lot of the time we don't know what to do with those "extra" bits (like mushroom stems, corn cobs and onion peels). Try keeping a zip-top bag or airtight container in your freezer to fill with scraps for making stock. Once you get a full bag or two, dump the contents into a large soup pot and cover with about a quart of water. 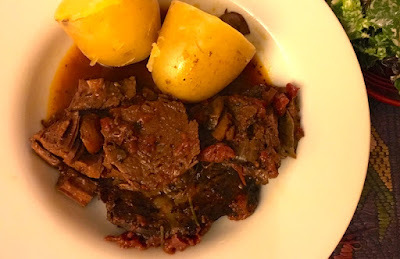 Add salt, pepper, bay leaves and any other aromatics you have on hand and let simmer for one to two hours to create a light broth to use in soups or other cooking projects. 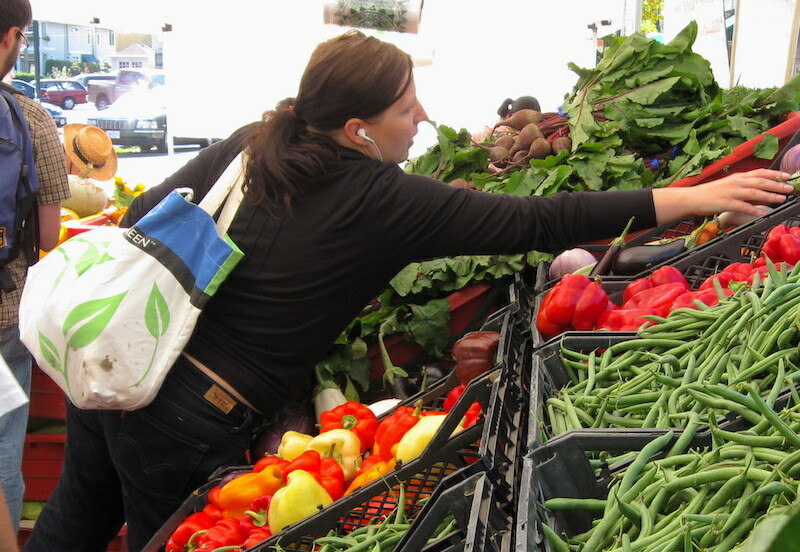 If you plan on eating or drinking at the market, consider bringing (some) of your own dishes. While our hot food vendors can't fill your personal tupperware, you can use silverware you bring from home to eat your meal. (Anybody else love those camping sporks?) You can also bring your travel coffee mug to be filled at some coffee vendors' stands, and carry a reusable water bottle to hydrate at the info booth. Small steps can make a big difference when we all practice—try some of the tips above to help us help the planet! 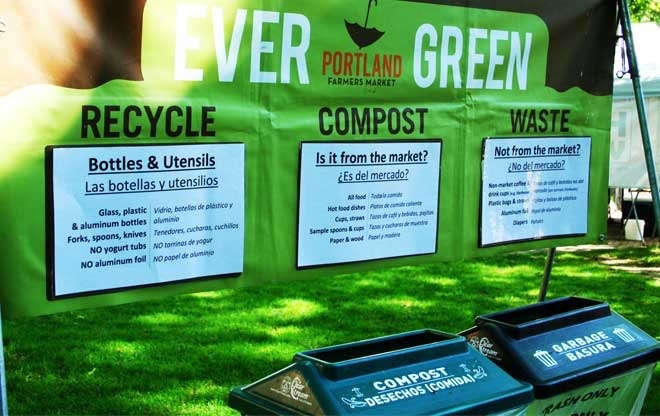 Photo of recycling station from Portland Farmers Market. 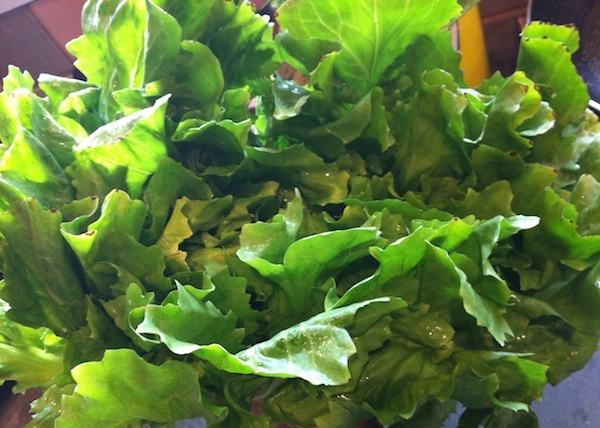 In the most recent Beaverton Farmers Market newsletter, market manager Ginger Rapport shared a comprehensive compendium of one of my favorite winter salad greens—though some tend to the reddish end of the spectrum. Their slightly bitter edge can be mitigated by soaking the chopped leaves in cold water for a couple of hours ahead of time, a trick I learned from Nostrana's Cathy Whims. Scroll down for a fantastic and slightly sweet dressing to serve on a salad of these lovelies. Chicories are closely related to lettuces, but are heartier and have a bitter edge. They are cool weather crops that come into season in late fall and some are starting to appear in our grower’s stalls. They include Belgian endive, curly endive, escarole and radicchio. 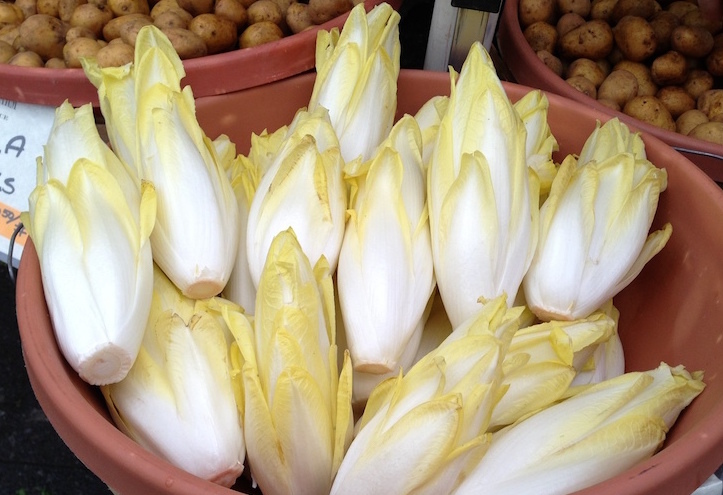 Belgian Endive is grown indoors, in the dark, to maintain the extremely pale yellow, almost white, tightly packed head of leaves. Red Belgian Endive is technically a small, forced radicchio. They can be used interchangeably with traditional Belgian Endive. Curly Endive (a.k.a. Frisée) has tightly closed, frizzy heads most commonly used in salads but it is also tasty when quickly sautéed with a bit of vinegar, such as sherry vinegar or balsamic. Escarole is crunchy, green and bitter. It stands up to bold dressings in salads but is also good grilled or broiled for a powerful accompaniment to roasted or grilled meats, and is fabulous creamed or in soups. Radicchio, possibly the most well-known chicory, grows in small heads that are brilliant magenta. It is often used in salads but also shines when cooked a bit. It pairs particularly well with assertive ingredients such as olives, blue cheese, apples, figs and walnuts. 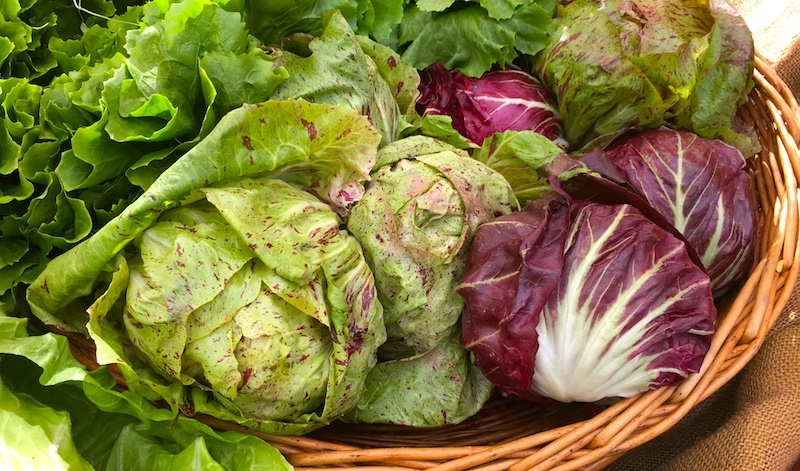 Speckled Radicchio is a cross between radicchio and escarole. It has a mild flavor with delicate leaves that can be used in salads but is sturdy enough to stand up to a little cooking. Arch Cape chicory from Ayers Creek Farm. Treviso Radicchio is similar in flavor to regular radicchio but is a little sweeter and grows in longer, looser-leafed heads. One unusual type, developed from an Italian variety and available locally in early March, is the Arch Cape chicory developed by Anthony Boutard of Ayers Creek Farm. Use treviso leaves in salads. Whole heads can be quartered and lightly grilled, or even stuffed and sautéed. Put all ingredients in a blender and blend on high until emulsified. Top photo of chicories from Flying Coyote Farm at the Hollywood Farmers Market. List of chicories was distilled and edited from The Spruce Eats. Get a taste of food policy as well as Oregon and European food and wine next Thursday, October 18, when I moderate a panel discussion featuring Dr. Lorenzo Terzi, European Union Minister Counselor for Health and Food Safety; along with Alexis Taylor, Director of the Oregon Department of Agriculture; Katy Millard, owner and chef of Coquine and a 2018 James Beard Award finalist; and Oren Kariri, Food Safety Manager of New Seasons Market. Scroll to the bottom of the post for details! Trade in food, plants and seeds has been going on since humans appeared on the scene, when potatoes and corn made their way from the Americas over to Europe, and the Spice Route, also known as the Silk Road, spread food and other goods along thousands of miles of terrain between Asia and Europe. Now things are a little more complicated, with strict regulations governing imports and exports between trading partners, and with standards on both sides of the Atlantic affecting what's on our plates today and how our global health might be affected tomorrow. One of the people who gets to worry about those regulations is Dr. Lorenzo Terzi (pron. TEHRT-see), a minister for health and food safety with the European Union (EU). 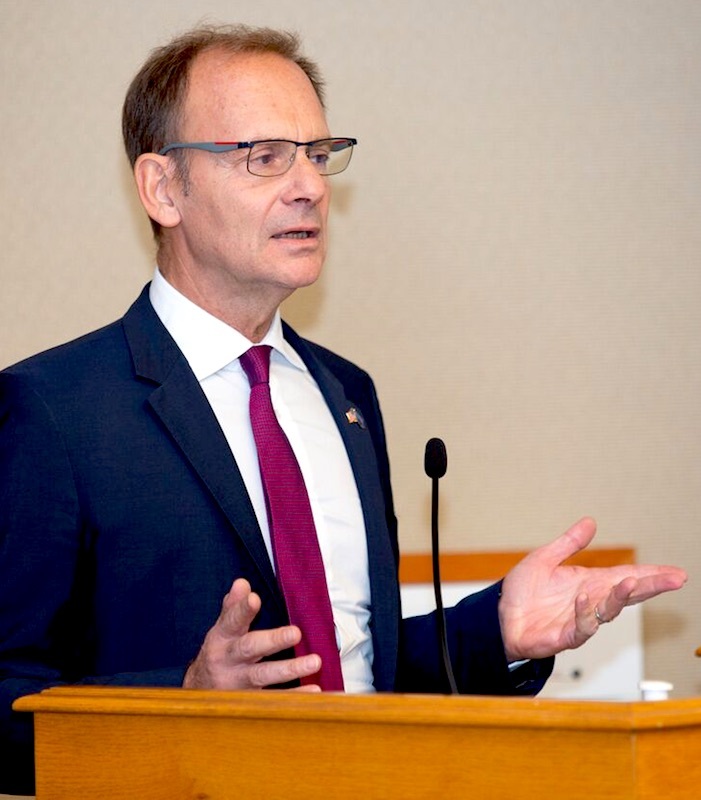 He's coming to Portland to help raise awareness about the European Union's standards for health and safety, touted to be, along with those of the U.S., among the highest standards in the world. 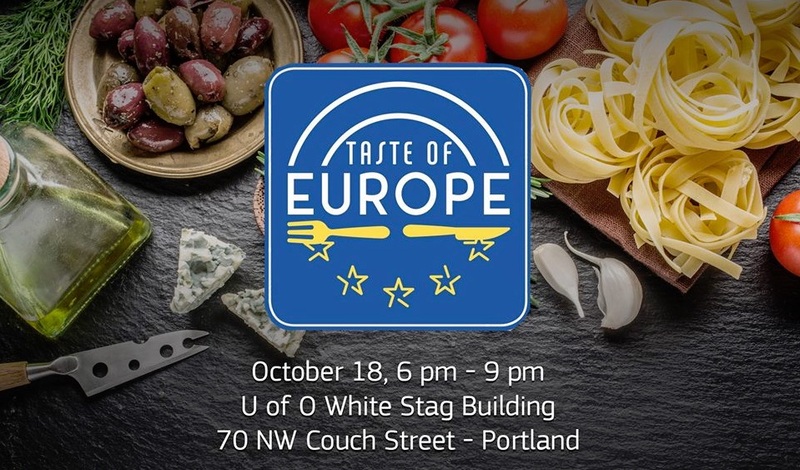 The EU Delegation decided to come to Oregon because of its standing as an important trading partner in agricultural products, or what Terzi calls "agri-food." In fact, it's the second trip for Terzi to Oregon in the last month, the first being an audit of U.S. standards and controls for plants and seeds intended for export to the EU to avoid the spread of pathogens. On this trip, in addition to the tasting and panel discussion, he'll be visiting a mint farm and a hazelnut orchard, both export crops for the state. 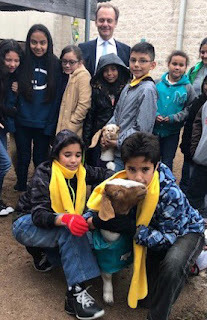 With school children (and the school's goat) in Austin, TX. His current position involved moving to Washington, D.C., a little over a year ago and working on the complexities of negotiations of trade agreements and regulations as they intersect with animal health, public health and food safety, animal welfare, and plant health. It also involves the difficult task of maneuvering around what he terms "red lines," or, as he describes it, "where it is objectively difficult to make progress or almost impossible." Those involve issues like hormones in meat or the use of certain chemicals in slaughterhouses, or the ability for the EU to export pasteurized dairy products like yogurt to the U.S. Since coming to the United States, Terzi has noticed a definite shift toward products that are sold as sustainable, grass-fed, pasture-raised or non-GMO, though he said there is almost no visibility of those products in Europe. 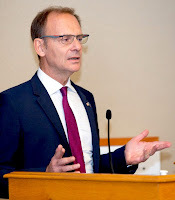 As for organic products, the U.S. and EU have been able to work out equivalent labeling and, he said, "wide areas [of grocery stores] are dedicated to these products both here and in the EU." Terzi said that his passion for his work springs from his upbringing in a family of farmers in the Emilia-Romagna region of Italy near Bologna. He still owns a small farm in the area and tries to make it back at least twice a year where, as he says, he has to fight with the weeds that seem determined to take it over. Should he win that battle, he said, he'd like to cultivate his current interest in the medicinal plants of the Mediterranean bush, and maybe some olive trees to support the olive production of his province. "Farmers are farmers, both in the US and the EU," Terzi said. "They have hard work and to me they are heroes." 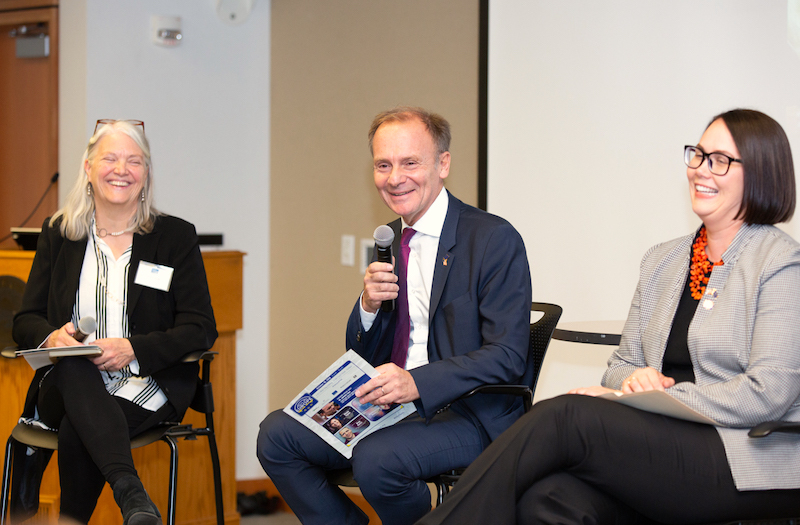 Find out what happened at the Taste of Europe panel and why Dr. Terzi, the lifelong diplomat, said that "there would be no barriers to trade between the European Union (EU) and the United States. Zero. None."